FILE - Jack Ma, founder of Alibaba, smiles during the company's IPO at the New York Stock Exchange in New York, Friday, Sept. 19, 2014.. When an influential anti-counterfeiting group allowed Chinese e-commerce giant Alibaba to join its ranks in April, the group said it was a collaborative move that would help stem the sale of fake goods for top companies such as Apple, Nike and Procter & Gamble. Instead, the decision has sparked an angry revolt among some members of the International Anti-Counterfeiting Coalition, who consider Alibaba the world's largest marketplace for fakes. The ensuing drama has led to outraged letters, anonymous memos, and high-profile defections. Now, an investigation by The Associated Press has found that the IACC's president owns Alibaba stock, has close ties to a key Alibaba vice president and uses family members to run his coalition. "It's crossed the line ethically," said Deborah Greaves, a partner at Brutzkus Gubner law firm who served on the coalition's board from 2011 to 2013. She said she didn't know that IACC chief Robert Barchiesi had stock in Alibaba until informed by the AP, calling it "really problematic." "Everything the IACC does that makes Alibaba look better potentially drives up the price of the stock," said Greaves, whose firm is still a member of the group. "As a board member, I would never have bought stock in Alibaba." The storm has bared the deep loathing some harbor for a company heralded as one of communist China's greatest capitalist success stories. At issue is the independence of a small but influential coalition that lobbies U.S. officials and testifies before Congress. Alibaba's membership could help shape the global fight against counterfeits, which damage companies' bottom lines, result in harmful products consumers purchase unknowingly, and feed a vast underground money-laundering industry that supports criminal syndicates. Since Alibaba joined, Gucci America, Michael Kors and Tiffany have quit the Washington D.C.-based coalition, which has more than 250 members. FILE - A customer points at a screen displaying a website of Alibaba's Taobao at a rural service center in Yuzhao Village, Tonglu, Zhejiang province, China, July 20, 2015. -The president of the coalition, Barchiesi, has owned Alibaba stock since its 2014 listing in New York. The IACC said in a statement that the holdings represent "a small percentage of his investment portfolio." -Matthew Bassiur, who took over as vice president of global intellectual property enforcement at Alibaba in January, hired Barchiesi's son, Robert Barchiesi II, to work at Apple back in 2011. Alibaba said that hire was made on merit. Apple declined to comment. -Bassiur is a founding board member of the ICE Foundation, which has been run by Barchiesi's other son, James Barchiesi, since 2013. That same year, the ICE Foundation board voted to award a contract for "fiscal and operational management" to a private company also run by James Barchiesi. The ICE Foundation, which supports U.S. Immigration and Customs Enforcement employees, has received grants of $10,000 from the anti-counterfeiting coalition every year since 2012, tax filings show. Some members have welcomed Alibaba. "I thought that was a good step forward," said Brad Buckles, an anti-piracy executive at the Recording Industry Association of America. "Bring them in so that you can complain to them. At the end of the day, if none of it works, you can kick them out." Jennifer Kuperman, head of international corporate affairs at Alibaba, said Bassiur's expertise would help the company "further instill trust in our marketplaces." 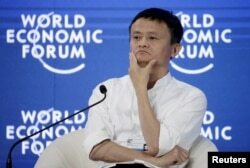 "We are highly confident in his abilities and proud to have him at Alibaba in this critical global role," she said. Critics, however, fear Alibaba will use IACC membership to gain legitimacy while papering over fundamental flaws in the way it does business. Gucci and other brands owned by France's Kering Group allege in U.S. court filings that Alibaba knowingly profits from the sale of fakes. Alibaba has dismissed the case as "wasteful litigation." Brands "are concerned that Alibaba will tout its membership as part of a propaganda campaign to falsely persuade regulators, prosecutors, consumers and investors that it is fighting counterfeiting when in fact it is perhaps the world's largest counterfeiting bazaar," said Geoffrey Potter, lead anti-counterfeiting lawyer at New York's Patterson Belknap Webb & Tyler. Michael Kors' general counsel has called Alibaba "our most dangerous and damaging adversary." For some, the admission of Alibaba, coupled with the personal ties that link it to the coalition, threaten the common sense of purpose that once bound the group. "Many brands are concerned that Alibaba's IACC membership and the personal ties between the parties will affect the IACC's ability to provide objective criticism of Alibaba in a public setting," said Kristina Montanaro Schrader, an anti-counterfeiting lawyer at Adams and Reese in Nashville and former coalition employee. The coalition's tax filings show that, in addition to the ties to Alibaba, Barcheisi runs his organization like a family business. The coalition paid companies founded and run by one of Barchiesi's sons nearly $150,000 from 2012 to 2014 for rental costs, accounting, IT support and advertising. It employs the son's wife, Kathryn Barchiesi, as a program manager. And though the coalition attests that its financial statements were reviewed by an independent accountant, tax filings show the accounting firm was owned by Barchiesi's son. In a statement, the coalition said the family connections had been disclosed and the contracts were fairly valued. "The board of directors of the IACC believes that Mr. Barchiesi's performance as President has been exemplary, and he has the board's full confidence and support," the statement said. Chuck McLean, a senior research fellow at GuideStar, an information service specializing in nonprofits, said such related-party transactions "are just not best practices." "This is a very common occurrence where individuals start to think of organizations as if they own them," he said. Anonymous emails have been flying, including a screed sent to board members Wednesday that detailed a list of concerns about governance and threatened a mass walkout unless Alibaba is pushed out. The writer claimed to represent a group of concerned members, but that could not be verified. "What you have allowed this organization to become is utterly disgusting and changes must be made immediately," the email says. FILE - Chairman and chief executive of Alibaba Group Jack Ma reacts during a session of "Future-Proofing the Internet Economy" at the World Economic Forum (WEF) in China's port city Dalian, September 9, 2015. The gathering storm threatens to turn the IACC's spring conference in Orlando next week, where Alibaba founder Jack Ma is scheduled to speak, into a showdown. "Start popping the popcorn," one coalition member wrote in a private email.